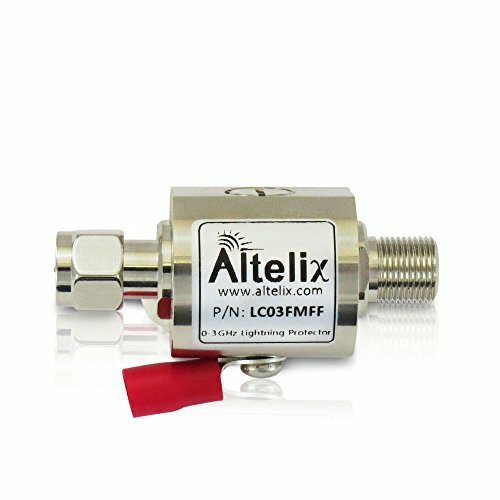 The Altelix LC03FMFF is a high-performance 75 Ohm coaxial F-Type Lightning Protector that operates over the frequency range of DC-3 GHz. This unit is ideal for protecting 75 Ohm 2G 3G 4G LTE cellular boosters and repeaters. The unit features type F-Male to F-Female coaxial connectors and a user replaceable gas discharge tube capsule that protects sensitive communications equipment from surges and lightning. This protector is also ideal for Direct Broadcast Satellite services because it will pass DC feed and control signals which are required for powering and selecting the desired LNBF at the satellite antenna. The DC passing feature can also be used to power remote amplifiers on CCTV systems. Its superior performance makes it ideal for DBS, and DTH Digital Satellite Equipment including DIRECTV® and DISH Network® receivers. It is also compatible with high-speed cable Internet services.